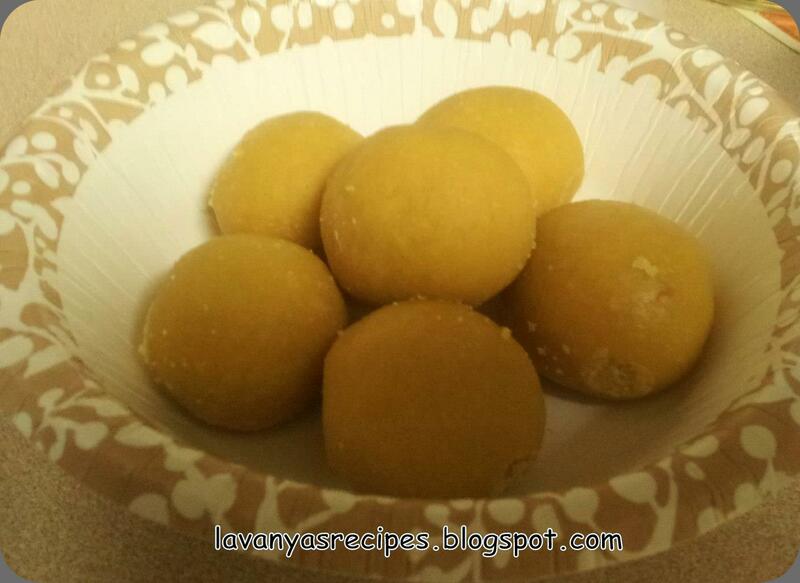 Besan Laddu is the most delicious and popular Indian sweet. Different types of laddu's are prepared at all festive and auspicious occasions in India. Besan is high in protein, very nutritious and healthy. To prepare besan laddu, it is very simple and easy. Besan, which is chickpea flour should be taken care while dry roasting as it has a tendency to burn if you are not alert. Traditionally, you need to dry roast besan on a metal tawa/wok but now it can be done in a brief span of time and very little effort is needed if you use a microwave. In a microwave safe bowl, combine besan and ghee. Mix well. Microwave on high for 3 minutes stirring after every minute. Reduce the power to medium and microwave for another two minutes, stirring again after every minute. The mixture should be reddish brown and should have a good aroma. Take care and make sure the mixture does not burn. Let the mixture cool completely. Then add sugar powder along with cardamom powder and mix it thoroughly. Add dryfruits(optional). Divide the mixture into portions larger than a lemon or as desired. Shape each portion into a smooth round ball and place on a plate/tray. Let the besan laddu's and set well for about an hour. Serve immediately or store in an airtight container. Enjoy the delicious besan laddu with dry raisins or fried almonds or cashews. Besan ladoo looks delicious and yummy. Besan ladoos look too pretty and delightful.